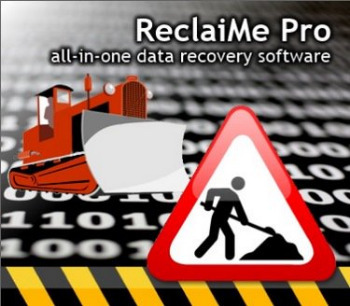 ReclaiMe is an easy-to-use and powerful data recovery application designed to hel you with your accidentaly deleted files. The program requires a user to make almost no decisions and have no technical skill at all.On top of that ReclaiMe works with many file systems (FAT16, FAT32, NTFS, RAW) which makes it universal. ReclaiMe is capable of processing large amounts of data, more than that; the program handles heavily damaged data well. If you think that there is a physical damage to your disk or just for some reason you don’t want to work with this disk directly during the recovery, ReclaiMe can create a disk image file, only to recover data from it without affecting the original disk. · You can preview the recovered data even before the recovery is finished. · The preview feature allows you to evaluate the quality of the recovery before purchase. · ReclaiMe handles heavily damaged data well. · High speed data reading and processing from various media. · Possibility of creating a disk image file for the recovery. · ReclaiMe works with most media types (memory cards from the cameras, mobile phones, PDAs, MP3 players, hard drives and so on), as well as with disk image files. · The recovery process doesn’t require any complicated and tedious configuration of the program parameters. Very simple to use – no technical skill required at all. Preview recovered data even before recovery is finished. ReclaiMe works with most media (from MicroSD to Bigfoot hard drive, you name it). Covers most any filesystem there is, including ReFS, the latest of Windows filesystems. Got awards and reviews from trusted sources. Undelete a single file or multiple files. Unformat a hard drive (desktop and laptop). Photo recovery for memory cards used by digital cameras, mobile phones, PDAs. NAS recovery for QNAP, Synology, WD MyBook, LaCie, and similar devices. Recover data in case of boot failure. Visualizes most known partition and filesystem objects: boot sectors, superblocks, partition headers in structured view. Search for hex patterns or text in any given encoding. Low-level data editing for extra leverage. Reads LDM, LVM, MD, Drobo BeoyndRAIDTM, Storage Spaces, and more. Finds lost partitions based on various filesystem structures in unpartitioned space. With ReclaiMe Pro, you can reassemble RAID automatically or manually. Supports RAID0, RAID10, RAID5, RAID6, HP EVA vRAID layouts. Content analysis and entropy visualization. Highly configurable high-speed imager, suitable for slight to moderate bad block cases. Sector-by-sector, VHD, and VHDX output. Provides verifiable and repeatable forensic file traces by mapping file content and metadata to its source on disks. Eliminates unnecessary files by cross-referencing well-known hash databases. Built-in file integrity testing.